Dance with Berbere Folklore, belly dancers, acrobats, and musicians. Pick up from your Marrakech hotel on the evening of the excursion. Transportation returning to your Marrakech hotel. 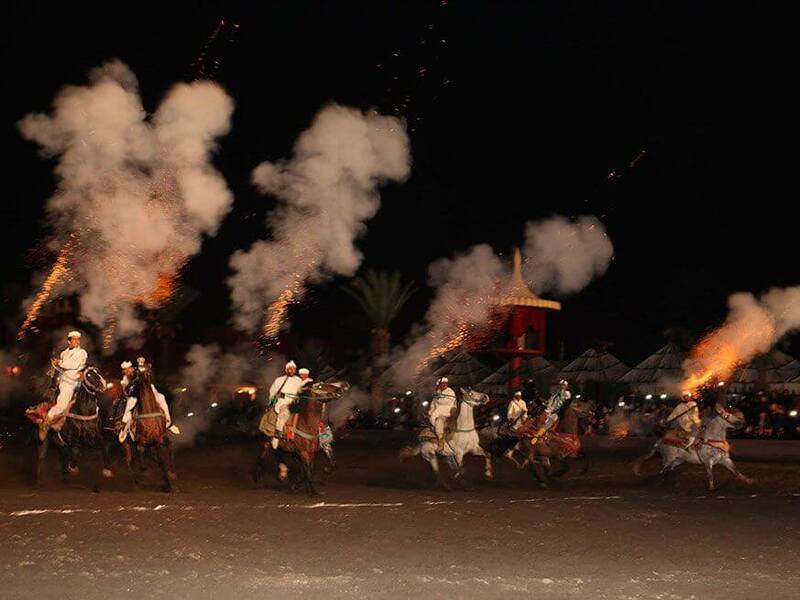 This is one of the most popular evenings out for holidaymakers and tourists staying in Marrakech. The action takes place in the evening, so you will be picked up from your hotel at a time between 7.30 pm and 8.00 pm. 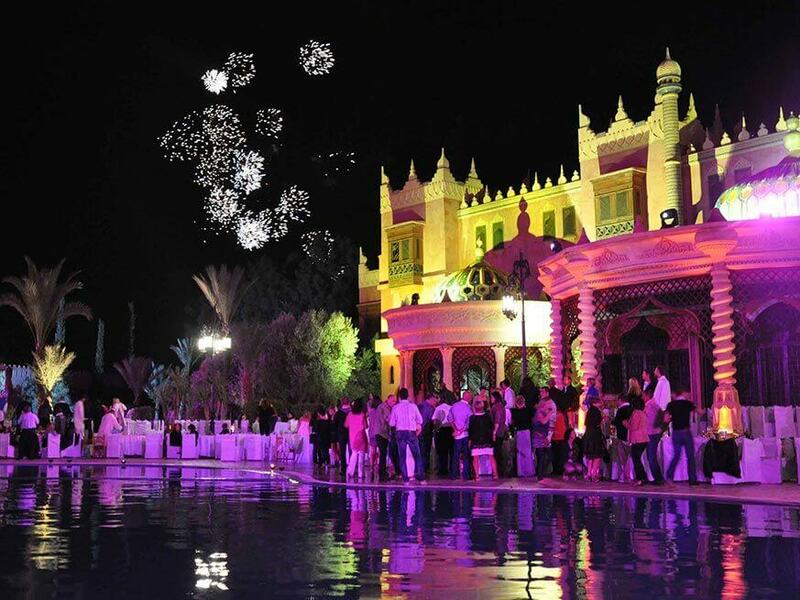 The dinner and show takes place in a desert oasis location, about half an hour’s drive from the city centre. 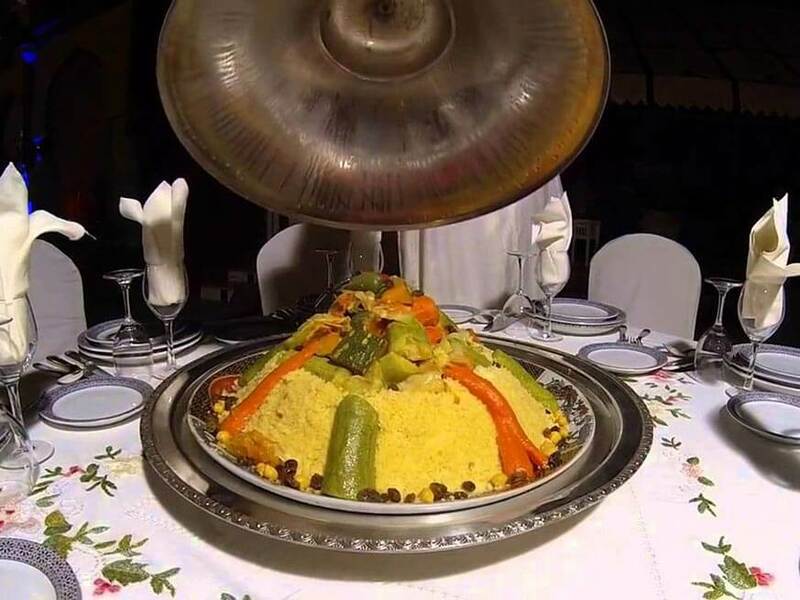 Your meal is a choice of four different dishes which include fruits of the season, couscous with seven different local vegetables, Moroccan pastries and min tea. 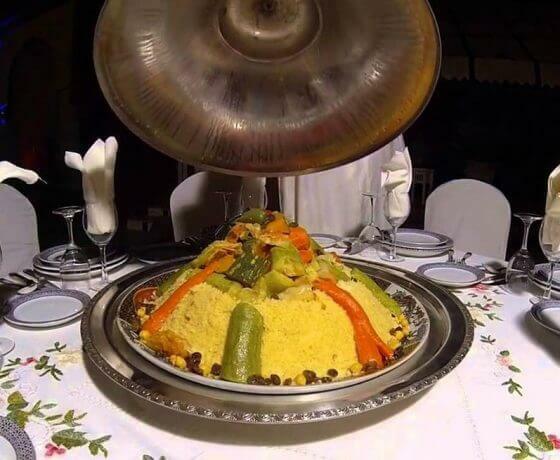 The delicious local cuisine offers a sumptuous meal of either chicken tajine with lemon, skewer meat, meat tajin with prunes or half a Méchoui. All meal choices begin with a starter of Moroccan Hariri. When you seat down for your meal you will be placed on cabaret seating tables under a caidal tent. 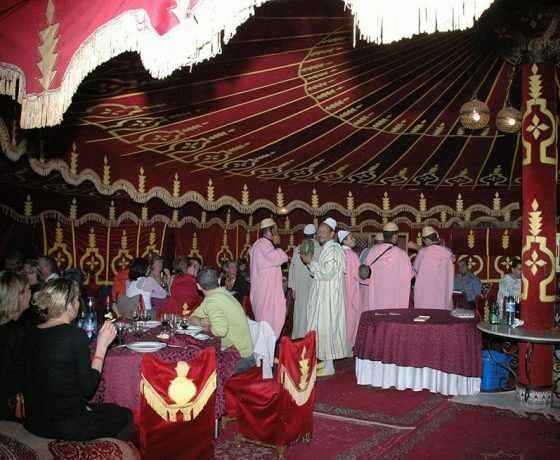 The entire dining area is lavishly draped in Moroccan curtains, gold table cloths and traditional carpets. A waiter service brings your meal to the table and you can order drink from here too. 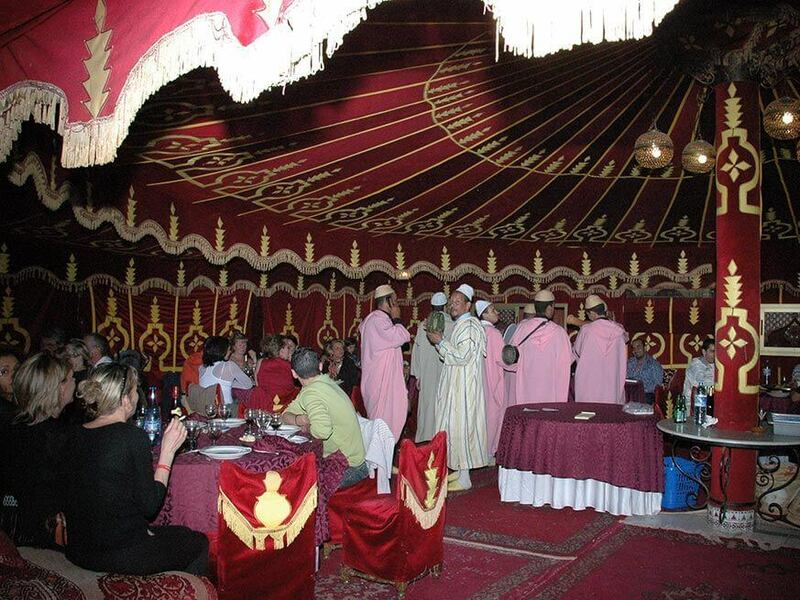 As you enjoy the delicious cuisine of Morocco you can purchase drinks (alcoholic or non-alcoholic) from the bar, which will be served to you at your table. The cost of this excursion includes the ticket price to get into the show. 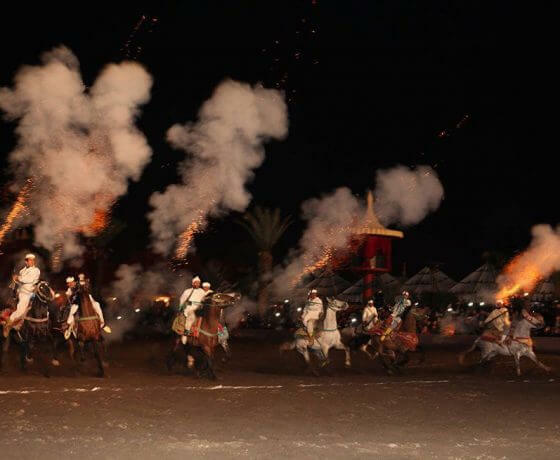 During the show you will see real Berber villagers entertaining with music, dance and horseback riding. There will be a team of acrobats performing and a firework display to accompany the action of the show. The Chez Ali Marrakech Dinner ends around midnight and your driver will take you back to your hotel around then. 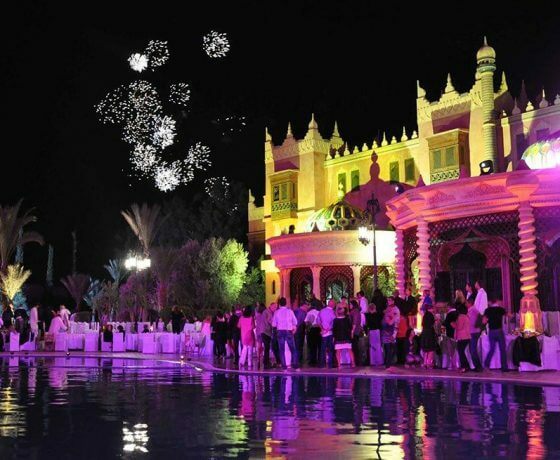 The entire evening will be one you’ll remember for a long time and features folklore of the local Berber village people all of which is set in the Marrakech Palmieri, about 10 miles outside the city centre. 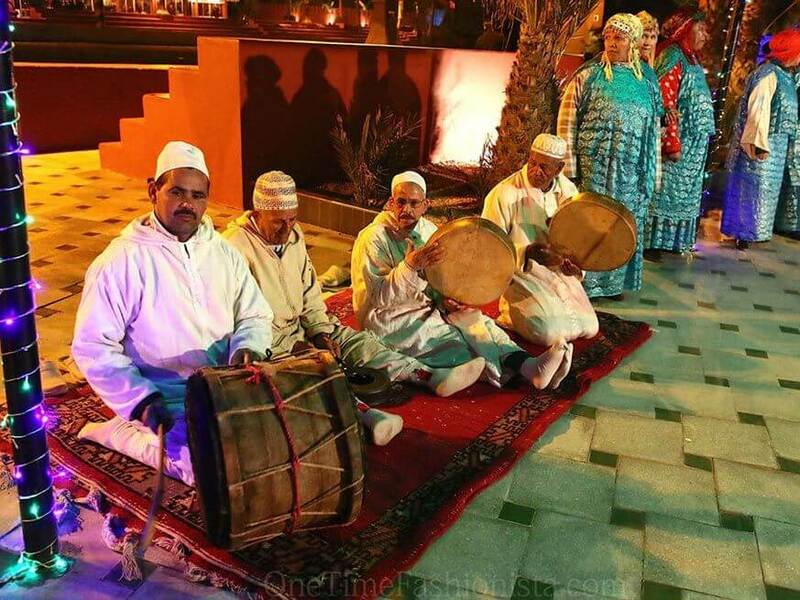 The Chez Ali Fantasia Dinner and Show is a fascinating insight into local culture and cuisine. 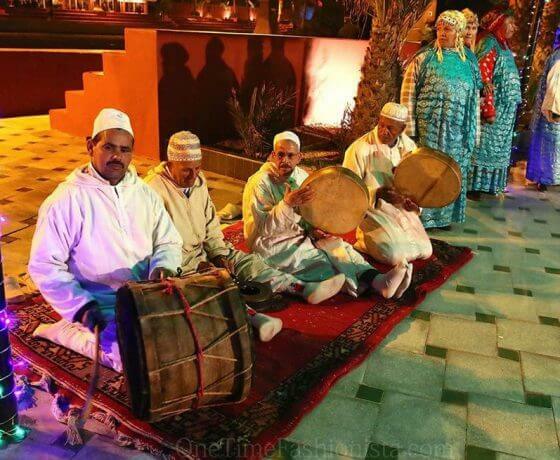 You will certainly know you are in Morocco after this outstanding evening dinner and performance. The evening is full of colour, sound, action and local customs and a perfect opportunity to take along the camera.